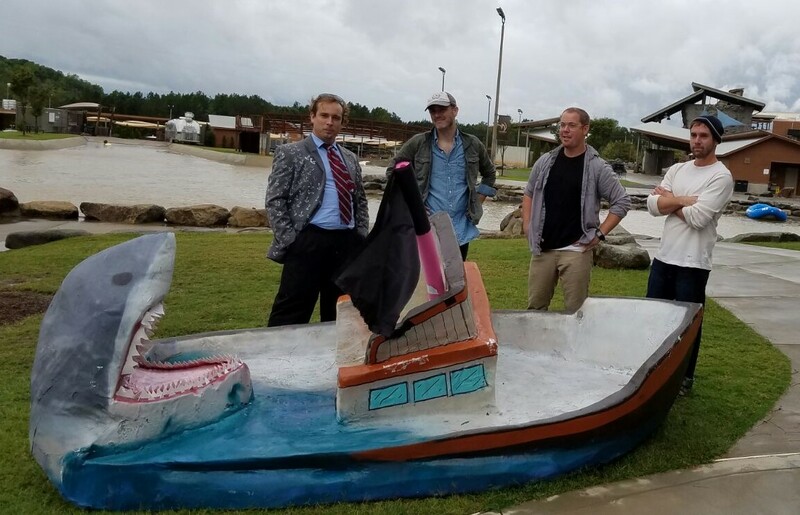 Andrew is on the right. His brother Phil, left, was recognized as a "Top 40 Under 40" in the nation last year. 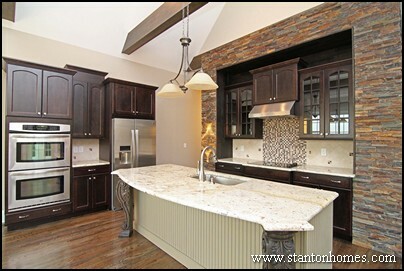 Two other Stanton Homes team members were chosen within the 3 previous years. Andrew Travars' extraordinary leadership, design/build craftsmanship and dedication to excellence has resulted his distinction as one of the nation's top professionals in the home building industry. 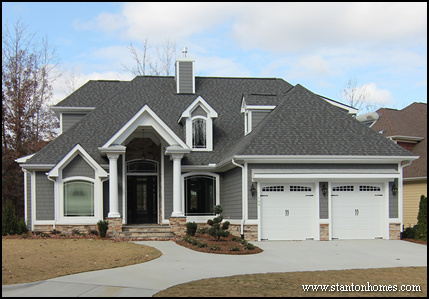 Andrew is the fourth team member at Stanton Homes to earn this prestigious honor over the past five years, further reaffirming the unprecedented excellence of this exceptional North Carolina custom home builder. 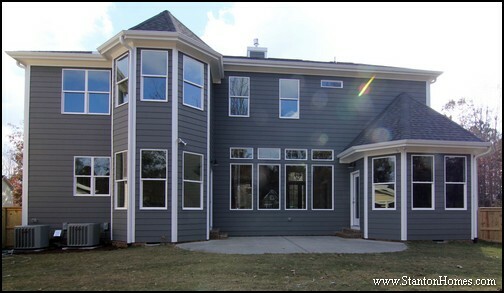 Project management of totally custom one-of-a-kind homes. 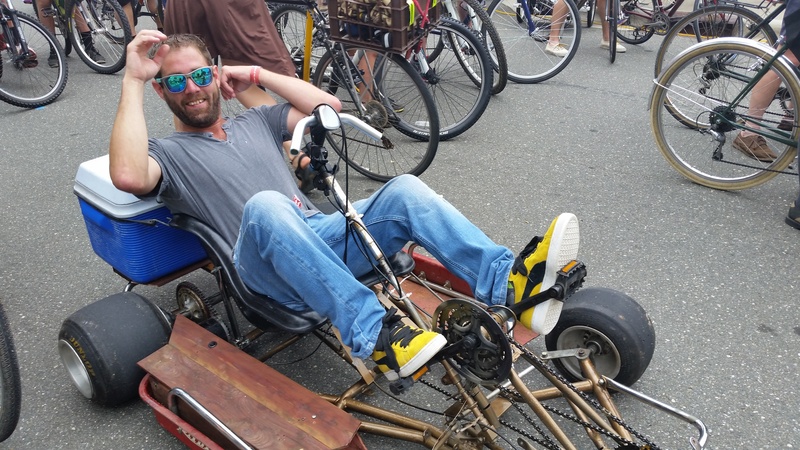 Design/build from scratch or with extensive modifications. 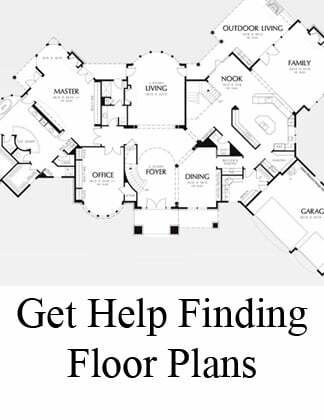 Working directly with clients, to integrate their "forever home" vision. 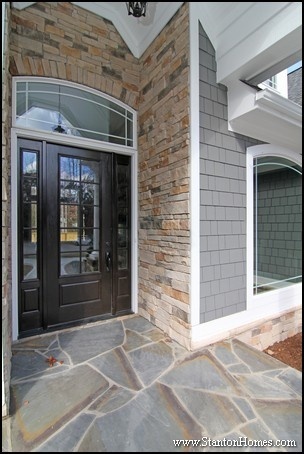 What makes working with one of the nation's top custom home builders different than a "semi-custom" or production builder? The phenomenal skillsets and dedication of people like Andrew, who as a top Builder/Project Manager at Stanton Homes has the ability to sketch a floor plan in a single sitting, while talking through the complexities of home building from an engineering perspective. 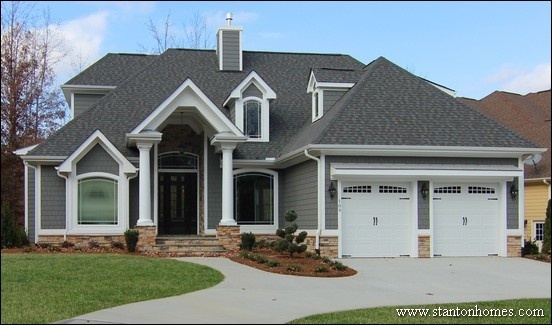 Here's an example of a floor plan Andrew designed and built in Chatham County, NC that's functional and cost effective - as well as beautiful. 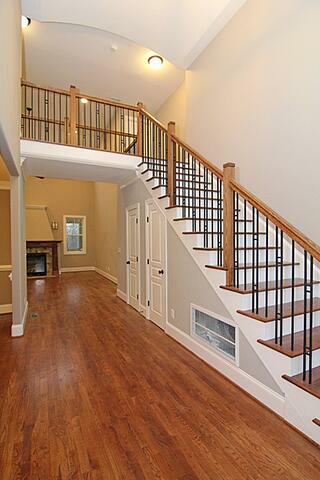 Custom wrap-around staircase, with a secret passageway for kids! 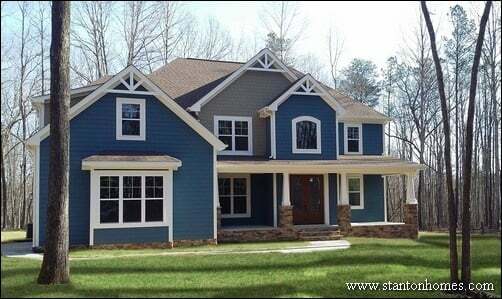 You can tour this incredible custom home in person at a special one day event. 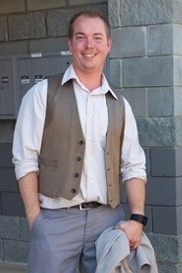 Come meet Andrew, and the rest of the award winning team at Stanton Homes, Saturday, January 28th, 1-3 pm. See everything inside this home, from built-in bookcases, drop zone, cubbies and desks to its spacious modern farmhouse kitchen design. 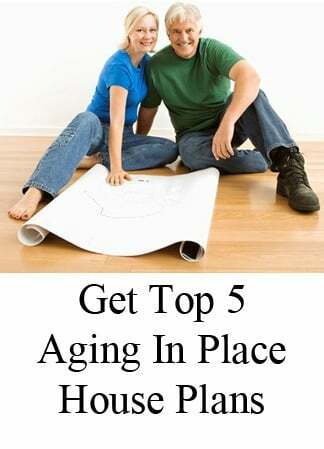 Andrew is also a certified Aging in Place Specialist – an important contributor to why Stanton Homes is a leading custom builder of aging-in-place, accessible and multi-gen coustom homes. Creative teamwork is one of the most frequent observations made by our clients about working with Andrew - take a look at the glowing reviews here to see more about the team approach at Stanton Homes, which played a huge role in Andrew's leadership award as a top builder in the nation. Andrew and Andrea formed the "A Team" many years ago, as two designers bantering Chip and Joanna Gains style. Their on-site "debates" and different approaches to creating special spaces contribute to the excellence of the finished product. 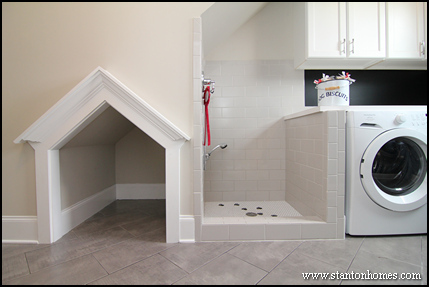 Andrew and Andrea surprised the homebuyers with "Putter's Place" - a dog house with a dog shower that has little puppy paw prints - which has won multiple awards for its creativity and practicality. 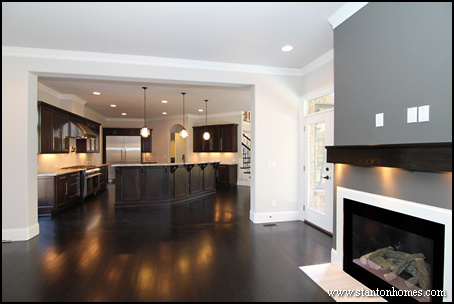 And a great example of how Andrew and the rest of the team at Stanton Homes believe in creating custom homes to fit the lifestyles of homebuyers. Andrew's creative approach to design continues "off the clock" as his pursuit of challenges centers on other projects to design and build. 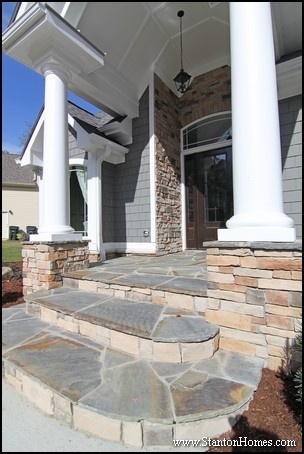 Professional Builder is the home building industry's leading national publication. Each year its "Top 40 under 40" competition seeks to award the most accomplished builders across the nation with this prestigious leadership recognition. 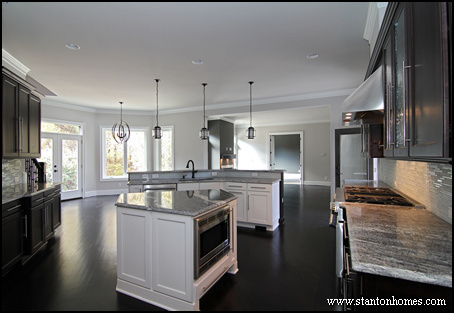 Stanton Homes has been design/building high quality, one-of-a-kind custom homes in the Raleigh/Durham/Chapel Hill area since 2006. The award winning team works closely with clients throughout the custom home build, with personal interaction with your builder, project manager, designer, production manager, coordinator, and sales consultant. Project Manager meetings site with at least six detailed, extensive walk throughs over the course of the build. Interior Designer sessions at expansive showrooms. 24/7 access to everything happening in your home, through a personal online portal that connects clients and the build team with everything that’s happening – and what’s next - with photos and updates along with extended warranties and guarantees. Read reviews posted by our homebuyers, here. Every home we build is filled with the personality of our homebuyers, with flexibility of choice and experts to help guide your decisions. Take a look at some of the Real Homes for Real People we’ve created together. 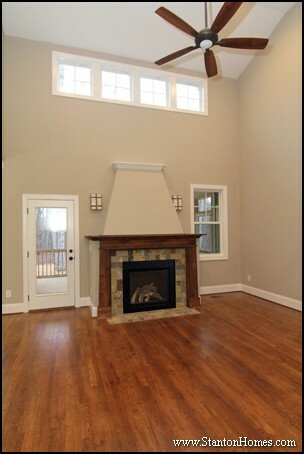 Big ceiling beams can provide big benefits for wide open living spaces. 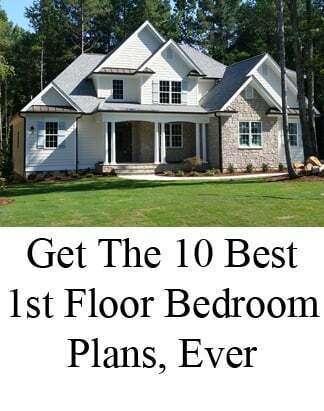 Here is what the Builder Brothers have to say about it, with explanations and examples of beam ceilings, together with photos to show the different styles you'll find in Raleigh new homes. Love the look of a lakeside cottage or a mountain retreat? Exposed beams are usually a focal point. But beams come in many forms, and can serve a key function as a structural component or simply add character to a room or home. 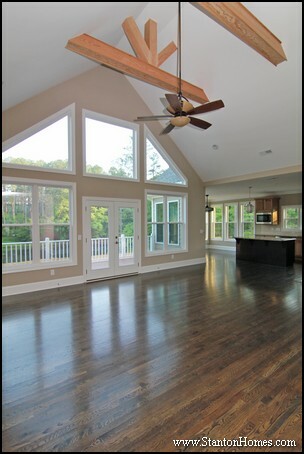 Without modern beams we would not be able to have the capability to have these wide open and highly desired floor plans. Decorative beams are often going in the opposite direction on a timeline, as they can be integrated into an 'old world' design theme. These non-structural stained solid beams bring to mind castles and chalets with soaring ceilings and timeless dark wood. The size and weight perfectly accentuates the open, vaulted ceiling over the kitchen and dining areas. It takes big beams to create open layouts - whether you see them, or not. It's a matter of form versus function. 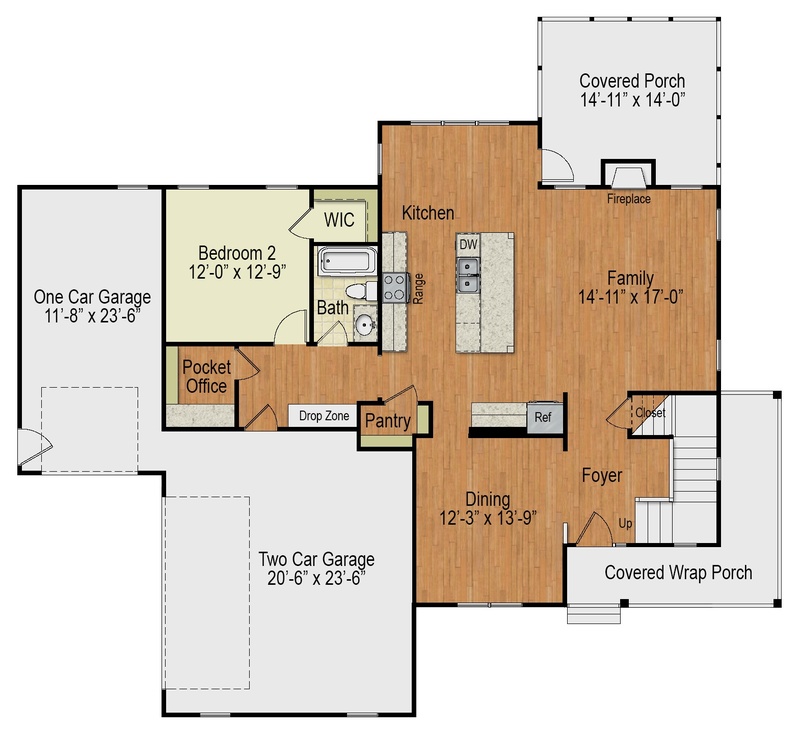 Structural engineers can be your best friend, when you want to build a home with lots of open living space. 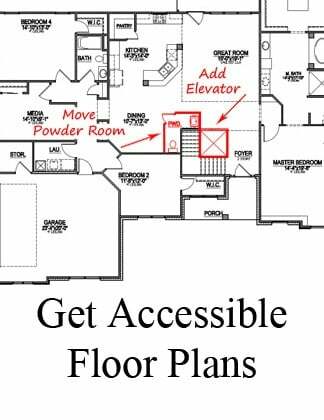 They work with the integrity of a plan, to create more contemporary, modernistic layouts that don't require as many weight bearing columns or walls. Functional beams carry large weights, like this entrance between a kitchen and a breakfast room. If you want to stretch an opening 12 or 15 feet like this, without using columns, you need the strength of steel - with beams that are hidden. Here is an example of a structural beam where the sitting room meets the bedroom. 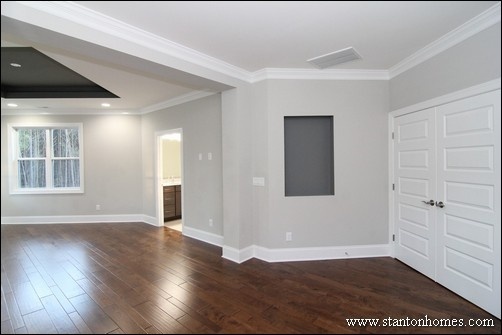 A large microllam LVL beam is built in, hidden underneath the paint and drywall. Timber beams are usually for visual appeal, as opposed to structural necessity. They are typically found in mountain or lake style homes, designed for rustic appeal. This photo of a cedar beam with a 'sunburst' detail is purely for the look. It was left 'natural' (no stain or paint) intentionally. 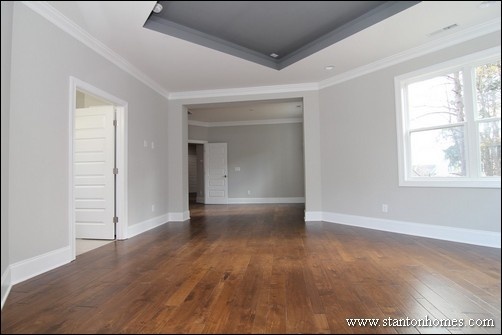 It draws your eyes up and emphasizes the tall vaulted ceiling. You can use many different types of materials and with the dozens of stain options out there, there are countless ways to create the look you have in mind. But, most exposed beams are wrapped with oak or cedar. 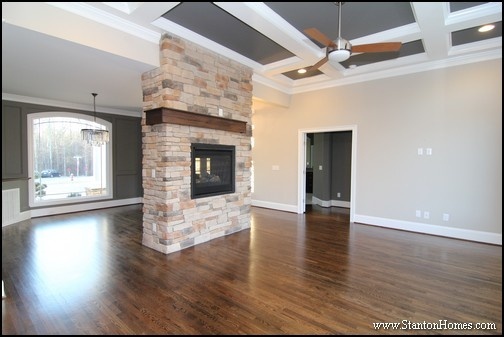 This two sided stone fireplace takes the place of a beam ceiling. The fireplace carries the weight of the second story, and is accentuated by a stained wood contemporary/rustic style wrap mantle. 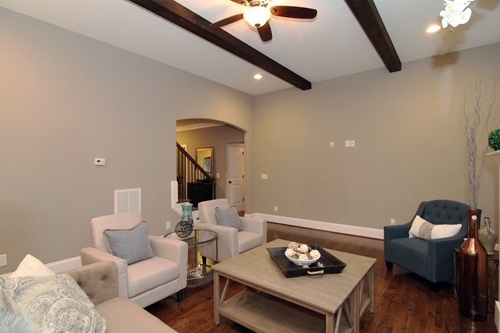 Beams can function as a structural component or simply add character to a room. 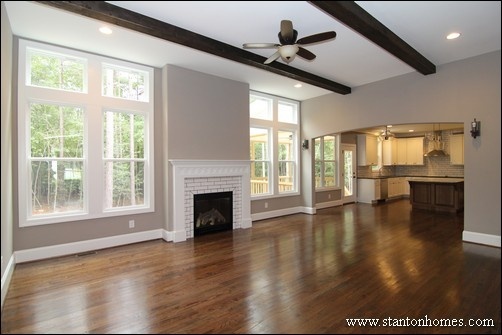 Without modern beams, new home builders would not be able to create open concept floor plans, which are highly desired in the Raleigh area. Can you picture beams in your new custom home? 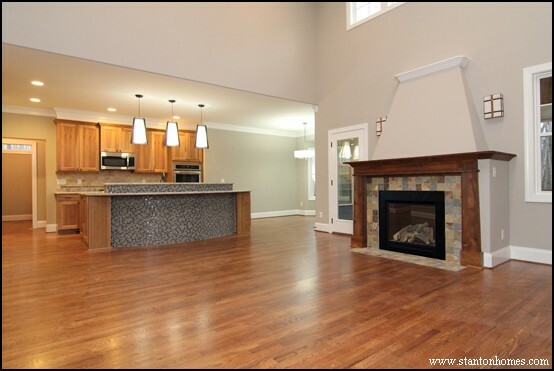 Tour new homes for sale right now - with beam ceilings - in central NC, or click here to get floor plans for custom homes coming soon. 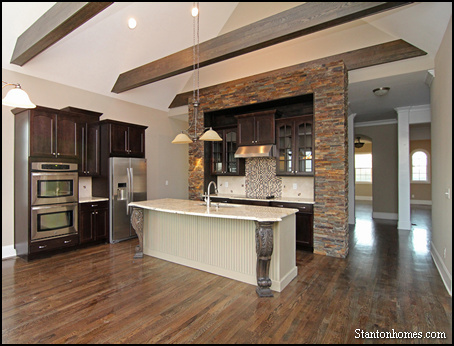 Builder Brothers Andrew and Phil are just part of the team at Stanton Homes, surrounding you with expertise while building stunning custom homes. A little friendly competition is reflected in the details of the extraordinary homes they create. They're all-around nice guys with a lot of smarts, really great ideas, and rare integrity. 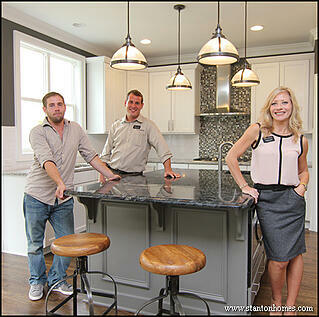 You'll learn a lot about how to build beautiful homes from the Builder Brothers.